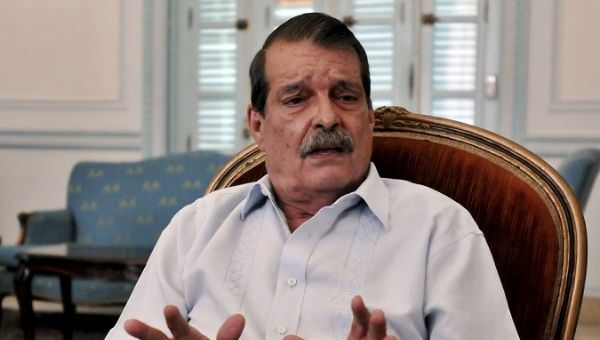 Cuban Deputy Foreign Minister Abelardo Moreno described the U.S. declarations in the UN Security Council, about the internal affairs of Nicaragua as interventionist and disrespectful. Sept 7 (teleSUR) Cuba rejected, on Thursday, the United States interventionist attacks against the Nicaraguan government, during its participation in the United Nations (UN) Security Council. “Cuba rejects with all energy any action that tends to impose a policy of regime change,” as stated by the Cuban Deputy Foreign Minister Abelardo Moreno. Abelardo Moreno also qualified the U.S. declarations as a disrespect to international law and the call for taking actions against Nicaragua. Moreno also denounced the insults against the democratically elected president of Nicaragua Daniel Ortega. “With an interventionist and disrespectful intervention, the permanent representative of the United States before the UN (Nikki Haley) called to take action against Nicaragua and to maintain the policy of dirty war against Venezuela, at the same time that, violating all international practices, launched insults against Daniel Ortega,” said Abelardo Moreno in his declarations. On the other hand, he stressed that the function of the Security Council is to deal with matters that threaten international peace and security, “which is not the case in Nicaragua.” Moreno explained that the current situation of Nicaragua is an attempt of destabilization, through violence and with a clear foreign interventionism. The U.N. Security Council meeting will move forward with a controversial decision to discuss Nicaragua and Venezuela, even without the consensus of all 15 members. On Tuesday, China, Russia, Bolivia and Ethiopia rejected the U.S. proposal to include Nicaragua and Venezuela on the council agenda, saying the two Latin American countries pose no international security threat and that doing so could jeopardize peace efforts.